Home Cookin’ is a regular feature in The Connection magazine. 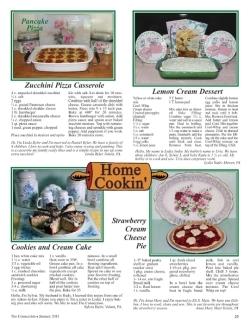 Each month Home Cookin’ serves up four recipes from Amish ladies from different communities. The August 2011 issue, for example, features recipes from the Adams County, Indiana settlement. I find I almost like the names of some of these Amish dishes as much as the dishes themselves. Adams County mother of four Sovilla offers up “Speedie Rolls”, brown sugar and cinnamon treats. Martha presents a “Quick Supper” (the only ingredients: hamburger, chopped onions, cream cheese, and cream of mushroom soup). And Emma, grandma of 43, gives us the inside track on “Nothings (Knee Patches)”, a dessert she believes “originated from the Swiss people”. Place zucchini in strainer and sprinkle with salt. Let drain for 10 minutes, squeeze out moisture. Combine with half of the shredded cheese. Grease casserole dish with butter. Press into 9 x 13 inch pan. Bake at 400 degrees for 20 minutes. Brown hamburger with onion. Add pizza sauce and spoon over baked zucchini mixture. Top with remaining cheeses and sprinkle with green pepper. Add pepperoni if you wish. Bake 20 minutes more. Hi, I’m Linda Byler and I’m married to Daniel Byler. We have a family of 8 children. I love to cook and bake. I also enjoy sewing and painting. This is a casserole my family really likes and is a simple recipe to use up some extra zucchini! Linda Byler Volant, PA. In a bowl beat the cream cheese then beat in Eagle brand milk. Stir in real lemon and vanilla. Pour into baked pie shell. Chill 3 hours. Mix the strawberries and the glaze. Spread over cream cheese mixture. Put Cool Whip on top! All I can say is, yum. For more info on getting Home Cookin’ and all the other Connection treats each month in your mailbox, go here. Thanks Richard, we have done a few recipes over the years, but not on a regular basis. Might be a good idea. I’d love to see theq”Nothings” recipe. Add flour to make a slightly stiff dough & mix well. Make dough into balls the size of a walnut. Roll out like you would pie dough, only roll out as thin as possible. Cut 3 slits. Deep fry in vegetable shortening or oil. Use 2 forks to flip it over to have it fried on both sides. Deep fry lightly, or they will turn brown. Sprinkle with sugar. We believe these were originated from the Swiss people. Hey Erik, I love this post, yummy… looks so good gotta try it out! Let us know how it goes Allie! I would lighten the zucchini casserole a bit in terms of fat, but that looks like a very useful recipe for big families and serving groups. I should have access to a kitchen in a few days – I’m off to Chicago for job training, and staying with a friend. Since my son lives nearby, I intend to try some new and improved recipes on him! I am missing this kind of food creativity. I’ll be in NC from tomorrow, and in PA later next month, so should hit a lot of these cravings I’ve been having (starting with good Mexican food). What is the Amish’s take on Mexican food? I’ve noticed lately more jarred salsa and “HOT” salsa. I recently picked up a jar of “HOT” zucchini relish and boy was it good. But it wasn’t Boston kind of hot but more sweet tastings. I recommend it and only wish I had purchased more from that Amish farmstand. Erik, that recipe for nothings, sounds alot like the pie crust cookies Mom and Grandma used to bake. They would roll out the leftover pie crust dough thing and then sprinkle with cinnamon sugar and bake it. We thought that was the greatest cookie ever! Keep the recipe’s coming for those of us that love to try new things. You love Mexican food, come on down to AZ. We have the best mexican food there is. HAve funin NC and PA.
Oh, another thing Erik. If your missing food creativity, you need to get married! Find a women that loves to cook and make new dishes. You could always learn to cook more. I don’t like to cook anymore either….used to, but cooking for one is just no fun….. Occasionally the cook bug bites, and I will make something….usually a one pot meal or a dessert….which is my favoite of all to cook…. Keep the recipes coming…..I enjoy them even tho I don’t cook a lot LOL…. 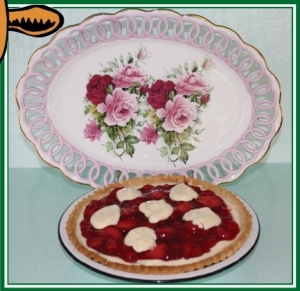 Strawberries and cream cheese in a pie cruse…what’s not to love??! Strawberries and cream cheese in a pie crust…what’s not to love??! Like Tonya, I, too have recently started a subscription to this magazine. (I highly recommend it—it’s like a vacation to read it.) I’m reading it cover to cover…learning more about the Amish all the time. 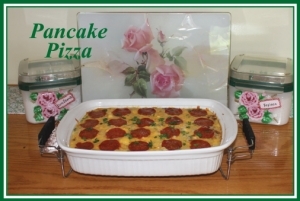 The recipes sound delicious, but being diabetic, I probably couldn’t have much of them (a tiny sliver of strawberry cream cheese pie, a modest scoop of the yummy looking casserole). Alice Mary, the cookbook Healthy Choices, by Miriam Wengerd, 2009, has no sugar and no white flour in the recipes. Maybe that is different than what you mean. Thanks, Lin, for the cookbook suggestion. I’ll see if I can find it via IL (interlibrary loan). Look for a book called “Wow! This is Sugarfree” by Deborah Steiner and Mary Yoder. They are mother-daughter authors of this cookbook and are Mennonites. I first found this book in the Amish store at Rentown, between Bremen and Nappanee, IN. Amazon has it or order it from your local bookstore. I think I’ll be buying one of these books before I give up my microwave. Thanks, Lance, that sounds like a good one. Even if I can’t order it via my own library, it sounds like a really good one to purchase. I appreciate your suggestion! I remember when I was able to eat real food, lol. It all looks good but unfortunately my body does not burn food like it used to, so it is more plain vegetables for me. Oh well I guess the trade is worth it because I really feel much better, now that I am eating healthy. In the “work” I’ve developed as retired-disabled librarian working with Amish and Old Order Mennonites to find things they want/need, I’ve had a few requests for sugar-free recipes. Helped a few women find sugar-free (other item like nut-free or dairy-free) cookbooks and so on. When they have things like that, they go right on to develop/adapt the recipes they already have. Thanks for posting the recipes Erik! I’m always looking for new recipes to try on the family. However, like a few others have mentioned, I have to do a lot of substituting or plan a secondary meal for my younger two children who have dairy allergies. I’m going to copy down the strawberry recipe, make one as-is, and adapt one for my little peeps. There are dairy-free “cream cheese” available at most all major health food stores and stores like Giant (east coast). I’ll have to figure something out for the Eagle milk though. Hi Erik, not commented for a while. Love these recipes, especially the nothings. Might have to look at a conversion chart for the baking. We use centigrade here in the UK. I found this website, I have never used it before but it may be of some help to you. Thanks, Tom. I have saved it to favourites. is there any way you could interview “The Amish Cook”? She has a syndicated column that has run for many years in many Indiana and Ohio newspapers. Her mother was the original columnist. When the mother died suddenly, one of her daughters took over. The strawberry recipe sounds delicious. Check out www.oasisnewsfeaturer.com, Kevin Williams is the owner & editor of “THE AMISH COOK ” and newspaper column. He also is the editor and handles Lovina’s newspapers articles in the newspaper too, she writes great articles and recipes and Kevin sees that they are printed in the newspaper…he is close friends with Lovina too, as he was with her mother who did the recipes for The Amish Cook…Kevin’s site is wonderful….please check it out….